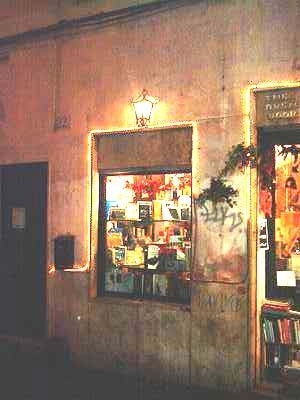 ROME - Perhaps the most dazzling yet under-utilised resource for English authors in Italy is the Open Door book shop in Trastevere’s via della Lungaretta. Run by South African writer Elaine O’Reilley and her business partner Lavinia Ciuffa, this hallowed expatriate institution was founded in the 1970s by Charles Nopar, who wrote a column for the old English-language Daily American but died four years ago. I find that losing myself in the eclectic collection of every kind of English book on the Open Door’s shelves is highly therapeutic, a tonic to the stress of daily Roman life. During scores of visits I have never failed to find something exciting to read, frequently a book by an author who I had never heard of who perhaps has unfairly become somewhat forgotten except to specialists. Tucked away at the top of the thrillers’ section I found, for example, The Lantern Network, by Ted Allbeury, surely one of the greatest ever spy stories of the Cold War, in which the author describes the rolling up by the Gestapo of a Second World War Resistance network in France and the repercussions this had in post-war skullduggery. Intrigued by this discovery, I went on to buy at least eight novels by this master of suspense, a former SOE agent who, along with Le Carré, broke new ground in British patriotic writing by making German characters sympathetic in novels such “The Good German” in which a middle-aged British agent marries the nymphomaniac daughter of a German spymaster he befriends during the early stages of the Cold War. No matter how obscure one’s field may be, there always seems to be something relevant to be found in Ms O’Reilley’s catalogue. For the last two years, for instance, I have been researching Polish sources for a memoir about growing up in London in the 1960s with a Polish father. Gems from Poland I have discovered in translation at via della Lungaretta include Tadeusz Konwicki’s masterpiece, A Minor Apocalypse, which has completely changed my view of the film maker Andrzej Wajda’s movies about the Polish Resistance such as Kanal. At Open Door I also found a rare copy of the diaries of Witold Gombrowicz, not an author I particularly like but one who it is essential to be familiar with for his influence in post-war Poland. In addition to modern literature, travel books, classics, books about Italy, architecture, all the arts, the stocks include a useful number of rare and valuable books for collectors. I procured here fine first edition copies of Harold Acton’s The Bourbons of Naples and The Last Bourbons for a fraction of what they would have cost from AbeBooks or Amazon, for example. When I lived in Paris, I spent many hours at the bookshop Shakespeare & Co by Notre Dame, which became an institution when its owner diversified into publishing Henry Miller and others. I often meet well-known Rome-based authors such as Desmond O’Grady and Michael Mewshaw at the Open Door, which deserves support from English-speaking expatriates, the British Council and the City of Rome. One only has to see how Oxfam and other charity bookshops have driven second-hand bookshops out of business in Oxford and other cities in the UK to understand how lucky we are in Rome to have the Open Door.